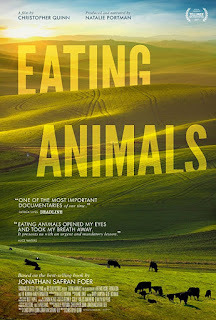 Read Marisa's review of Eating Animals. 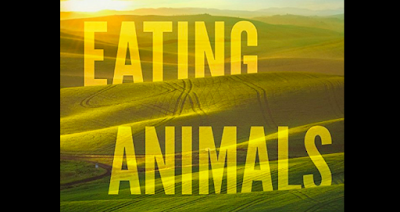 Eating Animals tells the story of the beginning of the end of factory farming. Produced with Academy Award®-winner Natalie Portman and Jonathan Safran Foer, the film is the feature-length adaptation of Foer’s critically acclaimed book of the same name that starts out with a simple question: Where do our eggs, dairy and meat come from? Through the intimate narratives of several farmers dedicated to bringing their trade – and the way we eat – back to its roots, the film explores the notion of stepping away from the practices of the past 40 years that have polluted our environment, endangered our health and caused us all to be complicit in the inhumane treatment of animals. Looking at the costs we’ve incurred as our country has become dominated by massive industrial complexes designed to feed the masses, EATING ANIMALS paints a picture of a future where traditional farming is no longer a distant memory, but is instead the only way forward. Eating Animals is in select theaters on July 6th, 2018. Christopher Quinn’s documentary follows Jonathan Safran Foer’s book of the same name in this melancholy piece. I was apprehensive to take this on, knowing full well I’d be shamed of my eating habits, but I guessed if Natalie Portman was passionate enough to narrate the film, I could give it a try. While this watch is a sucker punch right in the conscience, it dives deeper and keeps its cool along the way. The point here is that this film is created to instill a healthy respect for farming animals rather than take you on an hour and half long mental walk of shame. The industrial animal processing is presented and analyzed to pinpoint where we, as a society, went wrong. Where this film goes right is in its foundation is that there is always comments on hope in the future if we can all keep respect for animals. Even with my previous knowledge on the subject, I ended up learning a lot of new information. The facts and visuals presented regarding the environment especially were intriguing to me considering the already astounding amount of evidence inside the barn doors. There are multiple fronts presented and all are undeniably loaded. The pacing is fluid and the visuals are harsh at times but nothing too extreme to handle. It is just as much our responsibility to watch this and educate ourselves as it is for us to support and follow through with the humane treatment of animals. I would recommend this as a much watch for everyone. There is no pushing or guilt tripping, just truth and a lesson to be learned. This is definitely not a Friday night with friends watch, but a curl up in bed with your laptop and watch. 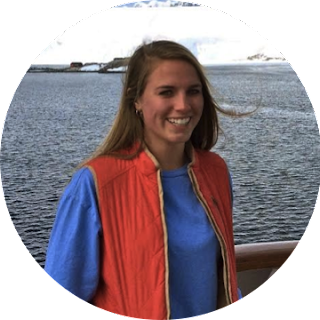 Click Here to check out Marisa's Articles.